Tuesday June 18th 1895 I was busy with the work all forenoon. Tishie came with the baby just at noon. Will had a great time getting the turkeys home after dinner and then went to town for some things as needed. weather pleasant. 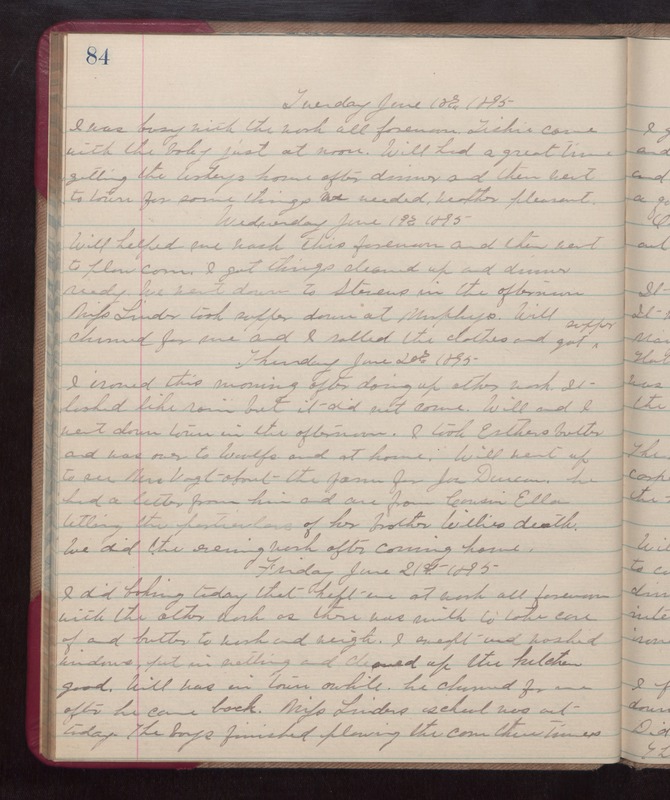 Wednesday June 19th 1895 Will helped me wash some this forenoon and then went to plow corn. I got things cleaned up and dinner ready. We went down to Stevens in the afternoon, Miss Linder took supper down at Murphys. Will churned for me and I rolled the clothes and got supper. Thursday June 20th 1895 I ironed this morning after doing the other work. It looked like rain but it did not come. Will and I went down town in the afternoon. I took Esthers butter and was over to Woolfs and at home. Will went up to see Mrs Vogt about the farm for Joe Duncan. he had a letter from him and one from Cousin Ella telling the particulars of her brother Willies death. We did the evening work after coming home. Friday June 21st 1895 I did baking today that [heft?] me at work all forenoon with the other work as there was with to take care of and butter to work and weight. I swept and washed windows, put in netting and cleaned up the kitchen good. Will was in town awhile. he churned for me after he came back. Miss Linders school was out today. The boys finished plowing the corn three times.